The Light Between Oceans. 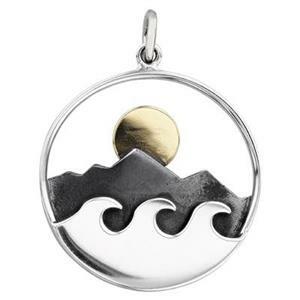 It’ll be Plain Sailing for your Jewelry Designs with our SN616 – Layered Ocean and Bronze Sun Pendant! The Ocean Waves in the foreground are bright Sterling Silver, the shadowed Rollers in the background are Oxidized Antiqued. And the Light above them is made of Bronze. Each Pendant comes with a 5.3mm Outer Diameter Closed Jump Ring - so it’s all ready to be hung from a Finished Sterling Neck Chain or one of our many Sterling Silver Earring Findings. I love this layered and colorful pendant; perfect for a simple, even unisex, necklace or for small, but highly visible, earring hoops! 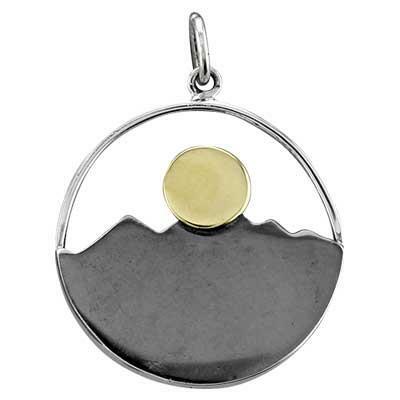 Folks are charmed by this pendant; it reminds them of tropical vistas visited, or wishing to visit.